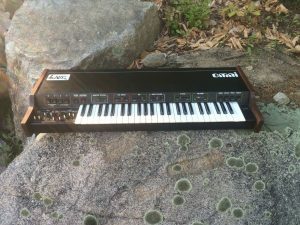 The Omni is an analog synth with preset Orchestral String sounds. It has polyphonic Violin and Viola waveforms as well as monophonic Bass and Cello waveforms. It is split into 3 sections: Strings, Synthesizer, and Bass synth – all simultaneously available. It has traditional and simple VCA, VCF, and LFO controls for contouring your sounds as well as a nice chorus that really thickens up the string sound. It has no program memory. 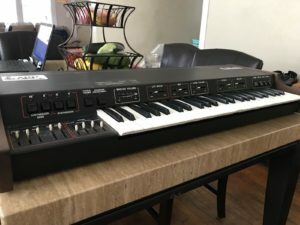 “This is a non working arp omni 1. We had a technician go through it and he replaced the caps, rebuilt the power supply, and replaced some of the ic chips as well. After this the unit would not pass audio. Not sure why at this point. 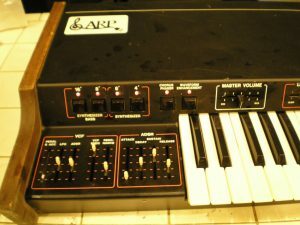 ” This is an Arp Omni I from the 70’s. It sounds phenomenal. This unit was fully serviced 2 years ago, and brought up to spec – every electrolytic capacitor in the synth was replaced, all of the slider switches were cleaned etc. Since then, I’ve only used it my studio. ” The Arp Omni is a 40-year old vintage synth now prized for it’s string sounds. This unit has been in storage for 20 years, but unfortunately only powers on, does not produce sound. Attempted to clean slider pots and installed ~30 new capacitors, but not expert enough to fix the unit. One slider is broken and most of the slider caps are missing. The power cable been cut and need a new cord. 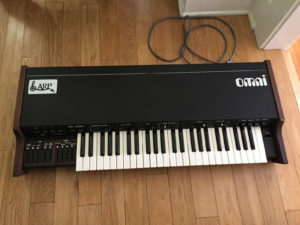 “The most awesome ARP Omni 1 ever! 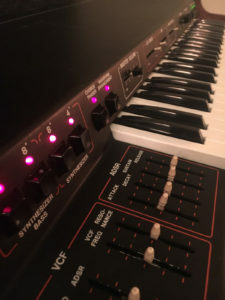 This synthesizer has just been fully serviced by Synthchaser, the west coast’s leading ARP specialist – recapped, new bushings, LED sliders, fully functional, calibrated, tuned and sounding great. This keyboard is the sound of Joy Division and is all over The Cars’ “Moving In Stereo”. It produces the lush Solina/String Ensemble sounds plus has a polyphonic synthesizer section with a voltage controlled filter, LFO, and ADSR. Synthchaser Capacitor Kit installed – 108 polarized capacitors in the synthesizer (not just the power supply) have been replaced to help provide stable operation for years to come. but still in a good working shape. always sounds Note in a String section. Synthesizer and Bass section sounds Good. All sliders, push buttons and keyboard keys 100%Works. Everything Original. Sounds really Great ! Need some professional adjustment and calibration. “Powers UP, Some Lights is On. except of the couple aftermarket ribbon cables. Missing Button tops and slider caps. Need a professional repair, service or just for a parts. and works, except a few dead notes. String control and Synth control. scratches on the top and corners, but No any Major Damage. 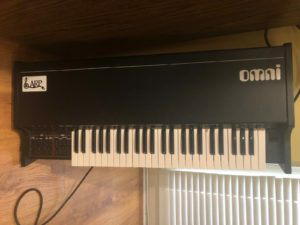 ” Up for auction is a vintage ARP Omni synth that’s in need of a little more attention than I’m qualified to give to it. I acquired this ARP about 18 years ago after spending about two years of careful searching. 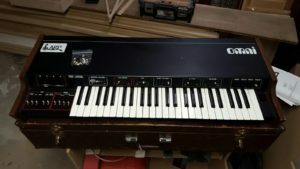 The synth operated flawlessly up until about 2010 when a hanging note started to manifest itself the viola and/or violin settings with two or more keys depressed. Upon testing it prior to deciding to list it, the discordant note becomes present as soon as either the viola or violin settings are engaged but is not present while using the bass or cello settings. It is also not present when using it in straight synth mode on the lower keys or in any monophonic setting. ” Here we have vintage mid 1970’s Arp Omni Model 2483 String Bass Synthesizer. The board powers up, all lights work and it passes a signal. It appears to have the same sound when a key is triggered. When some sliders are moved you can hear the signal being effected so perhaps something that could be a minor fix.